East Coast testing: Polaris’ 800 wide ride. In the 2013 pure sport side-by-side category, Polaris’s RZR 800 and 570 own riding areas with tight 50 in. trails, while the XP900 and its rivals battle for supremacy of the dunes and rough high-speed trills found out West. So, where does this leave the once almighty RZR S? In southern Ohio, we are surrounded by a number of off-road parks that allow Jeeps, and buggies, in addition to ATVs, so a majority of their trails are easily wide enough for the RZR S’s 60.5-inch width.However, most of the trails are tight enough that you don’t really need the explosiveness of the XP’s engine or its longer wheelbase. On paper, the RZR S looks like the perfect solution for the East Coast, wide Trail Rider, so we decided to put it to the test where we live to find out. To put our S to the test, we acquired the services of pro ATV motocross racer, Casey Martin, who has owned a RZR S for 10 months, and Jennifer Wingate, an off-road novice with some entry level ATV experience. Our goal was to see what the machine was capable of doing, and how well it worked in the hands of a timid, first time UTV enthusiast. The RZR S is powered by Polaris’s High Output, 760cc, inline, twin cylinder, water-cooled four-stroke engine, reported to produce 55 horsepower. With a listed dry weight of 1022 pounds, Polaris claims it will accelerate from 0-35 mph in 3.8 seconds. In previous testing out West, we have had the S up to 56 mph and still gradually climbing. When you stomp the gas, the RZR S feels willing with lots of torque. It gets you out of the hole quickly, which comes in handy when attacking steep climbs with little run at the bottom. When you stomp the gas, the 800 feels willing with lots of torque. It gets you out of the hole quickly, which comes in handy when attacking steep climbs with little run at the bottom. There’s power to spare for cruising wooded trails, which makes it a blast to race from corner to corner in the trees. There is enough power to keep things fun in wide-open spaces; however, the dated pushrod engine design lacks the explosiveness of the XP’s modern overhead cam engine. You can get the S to slide, but it takes a little more timing and throttle. The S’s power plant doesn’t allow the same level of control over the vehicle for carrying the front end over whoops and jumps, due in part to less horsepower, but more to the fact that the S simply doesn’t build RPM’s as quickly as the XP. That being said, no other UTV on the market, at or below this displacement, jumps or slides as well as the RZR S.
As the trail tightens up and gets more treacherous, the strong torque and smoother delivery of the S’s engine works to its advantage. It doesn’t feel overwhelming in tricky sections and does a great job of taking advantage of available traction. Polaris’s automatic PVT transmission features park, reverse, and neutral, in addition to two forward ranges. Clutch engagement is butter smooth without feeling excessively laggy, which aids on tricky takeoffs. We found high range perfect for most trails while low range came in handy for rock crawling and the most intimidating ascents. The RZR’s engine doesn’t feel overwhelming in tricky sections and does a great job of taking advantage of available traction. We’d like to see this unit come with engine braking standard, if not Polaris’s Active Descent Control. You can use the engine for braking on long downhills, but it requires feathering the gas pedal to keep the PVT engaged.Shifting into low range will further help. The two-wheel-drive/all-wheel-drive system allows you to shift from full time two-wheel-drive to all-wheel-drive on the fly. In all-wheel-drive, when you hit the gas, if the rear wheels begin slipping marginally faster than the front wheels, the front end locks in and begins pulling. This lets you enjoy light steering a majority of the time, while providing extra traction in the slippery spots. Through the years, AWD has been all right with us. At 60.5 in. wide, the RZR S enjoys a notable advantage in stability, compared to the 50 in. 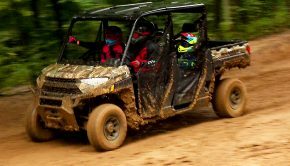 RZRs, and all of the sport utility UTVs we’ve tried from various manufacturers. Even compared to the latest high-dollar machines on the market, the RZR S’ stability is rock solid in corners and off camber trails thanks to its adequate width low center of gravity.At 77 in. long, the S has the same wheelbase as the 50 in. RZR. This helped keep the turning radius manageable in most trail situations, and we rarely needed to employ a three-point turn. With the tires protruding from the front, the RZR S can attack some gnarly approach angles without dragging the front of the car. The S does an amazing job of hugging the hill on steep climbs, building your confidence in what’s possible, then rewarding you for it. It’s truly fun to drive! With the tires protruding from the front, the RZR S can attack some gnarly approach angles without dragging the front of the car. The RZR S enjoys 12 inches of ground clearance. Thanks to its extra width, the RZR S is able to run two-inch taller tires, compared to the 50 in. RZRs, and gain stability at the same time. The 27 in. ITP 900 XCT’s tires come mounted on sharp looking cast-aluminum wheels.The tires’ taller size, combined with longer control arms and more suspension travel, yield two more inches of ground clearance at 12 in. Load down the car with two occupants and take a run through the rocks. That extra two inches of ground clearance feels like an extra foot. We were surprised at the size of some of the rocks and logs we were able to traverse without dragging the bottom of the machine. For times when you to run out of ground clearance, the plastic chassis skid plates are a welcomed feature, but we’d switch to something a little tougher from the aftermarket if you plan on driving in sharp rocks. Steering on the S is responsive, but by no means twitchy. The car does a good job of going where it’s pointed without ever doing anything unexpected. We found the steering pretty light without the aid of EPS. The tires did a good job of controlling direction and getting the power to the ground, but wear quickly in hard pack, in addition to providing a buzzy ride at low to intermediate speeds. 12 in. of suspension travel at all four corners is a nice solid number, especially for the less whooped-out trails on which we ride. 12 in. of suspension travel at all four corners is a nice solid number, especially for the less whooped-out trails on which we ride. The chassis features dual a-arms up front and a lower a-arm with large beefy upper control arm out back.While the base model’s stock shocks are only preload adjustable, they are set up well for most situations. They provide a plush ride over small trail obstacles, and perform admirably while picking your way through large rocks. The suspension on one side can compress a bunch to eat up the impact with a rock, while the other side reaches out to keep that tire in contact with the ground. Meanwhile, driver and passenger float comfortably overhead. Jeeps don’t ride this well. At the other extreme of suspension performance, the shocks do a good job of resisting bottoming, landing from a few feet of air even on imperfect landings.Rebound damping was a little bit on the fast side for whoops, although it never started bucking or swapping uncontrollably.For entry-level shocks, they work respectably well everywhere and quite well on the typical trails we encounter in the eastern part of the country. the shocks do a good job of resisting bottoming, landing from a few feet of air even on imperfect landings. The biggest drawback to these shocks is that they are not rebuildable. This means that if you ride your RZR regularly, you can expect to face the expense of purchasing aftermarket shocks in a couple of years, or you spend a little more now and get one of the Limited Edition models that come with Fox Podium X piggy back reservoir equipped shocks, which are rebuildable and feature compression damping adjustment. Braking performance is superb on the S, thanks to hydraulic disc brakes at all four corners. The front brakes feature dual piston calipers, enhancing power, while steel braided brake lines increase power, improve feel, and help resist fading. Feel through the pedal is quite good. While we wouldn’t call them overly sensitive, you can lock all four wheels up and stop on a dime. The cockpit on the S is well thought out, although a little on the small side according to many drivers over 6 ft. tall. A tilt steering wheel, plus the best-designed passenger grab bar on the market with adjustable reach, are great features. The seats can be slid forward or rearward, but require removing the seat and loosening four hex head bolts on the lower rails to change the seating position. This is a pain when the occupants are radically different in height, yet both want to take turns driving. Why can’t they feature a lever and rail system like the ones the automotive industry has been using forever? The seats are placed low in the car, lowering the center of gravity while providing you a good feeling for what the machine is doing underneath you. The occupants are surrounded by a ROPS certified roll cage. Door nets allow you to get in and out quickly, while offering a measure of protection by helping keep your limbs inboard in the event of a rollover. Three point seat belts offer easy in and out protection, while their anti-cinch design takes it easy on your collarbone in the rough stuff. A three-gallon water resistant glove box resides on the passenger side, in addition to dual cup holders found in the center console. The rear cargo box features 300 lbs. of capacity and features Polaris’s lock and ride system, which lets you easily install various bed accessories. A rear 1.25 in. hitch receiver allows you to tow 1500 lbs. 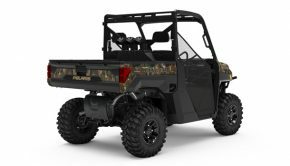 Polaris offers several limited edition models of the RZR S with premium features such as Fox Podium X shodks and electric power steering. As we mentioned before, Polaris offers a few LE models of the RZR S, 3 to be exact. The Blue Fire and Orange LE models feature painted plastic, Maxxis Bighorn tires mounted on Black inlayaluminum wheels, and of course, the addition of high-performance Fox podium X shocks. The Fox shocks make these models worth the extra $1300 asking price by themselves. When the shocks on our base model get tired, we will have to replace them with aftermarket shocks anyway which will set you back $2000-$3000. The Sunset Red EPS LE model features all of the upgrades of the other LE models, plus the benefit of electric power steering. We have tried the Polaris EPS system in the RZR 4 and it worked wonderfully. Our only delimit with this unit is that its retail of $14.999 is within $1000 of the base model XP900, which comes stock with Podium X shocks. 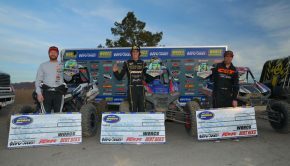 The RZR S’ outstanding performance really made it shine back East in our neck of the woods. It’s got the engine and handling necessary to go fast, but it’s the extra suspension travel and ground clearance of the S that really makes us continue to love this model. Casey Martin showed us what the stock RZR S was capable of, while the RZR S helped show test rider Jennifer what she was capable of as she got up the courage to get her first bit of air time on an off-road vehicle. Of the half dozen or so vehicles we have let her ride or drive, this is the first one she was asking to take out and drive again. Guys, if you want to get your lady into off-roading, here’s your ticket! 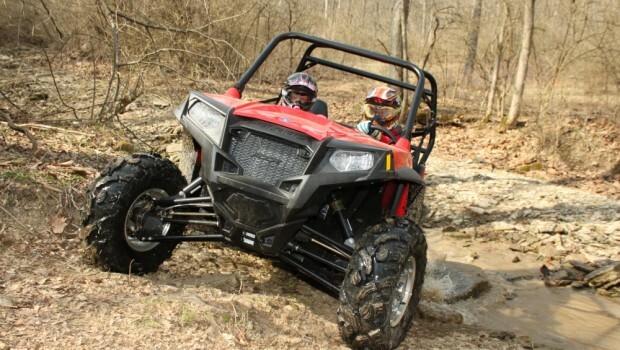 The RZR S’ outstanding performance really made it shine back East in our neck of the woods. While there may be faster cars for the guys out West, and 50 in. trails simply won’t let the RZR S pass through. If you’re like us, and ride in wooded areas with jeep or buggy trails, the RZR S is nearly the perfect blend of performance, drivability, and price. 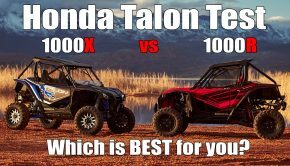 For everyone else, The RZR S may no longer set the standard in pure sport side-by-side performance; however, it has all the attributes needed to be a great sport machine at a price that puts it in a class by itself. Summary: While there may be faster cars for the guys out West, and 50 in. trails simply won’t let the RZR S pass through. If you’re like us, and ride in wooded areas with jeep or buggy trails, the RZR S is nearly the perfect blend of performance, drivability, and price. For everyone else, The RZR S may no longer set the standard in pure sport side-by-side performance; however, it has all the attributes needed to be a great sport machine at a price that puts it in a class by itself.